Over the coming weeks, we’re going to be telling you about our annual Client Hack Day. A highlight of our calendar, the event brings our team and our clients together, to work collaboratively on a real-life brief in a super short space of time. While the aim of the game is to come up with a working proof of concept by the end of the day, it’s also about having fun while developing skills and learning something new. 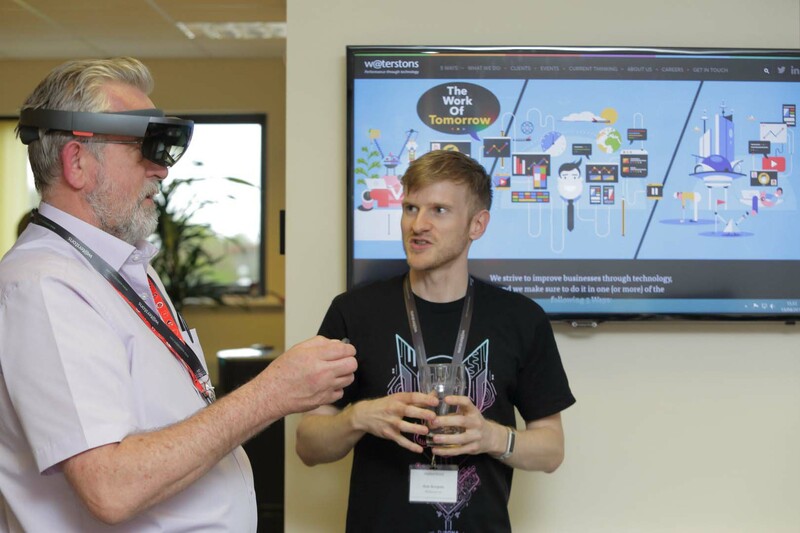 During our client Hack Day we were joined by three members of the DCC team at Waterstons HQ with a very particular challenge in mind for us. 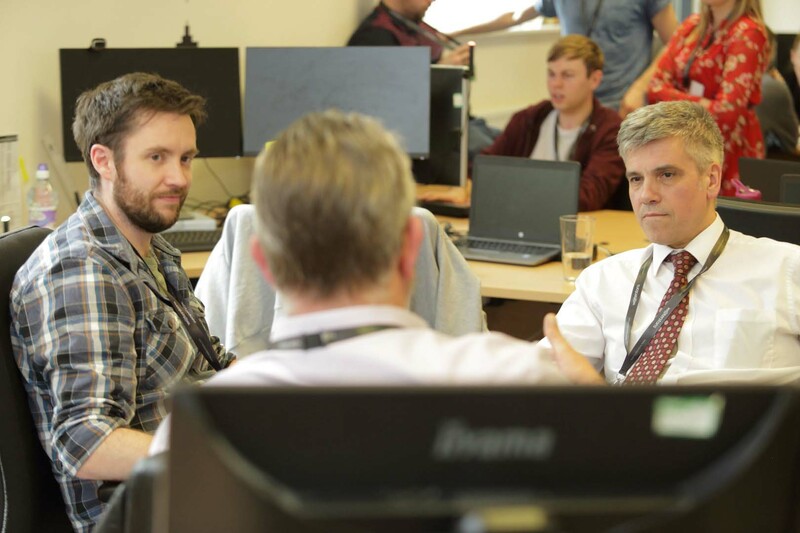 Phil Jackman, Head of ICT Services, Bob Gibson, ICT Strategic Manager, and David Williams, Corporate ICT Support Manager, came along to talk about their internal customers’ needs. DCC is one of the most-populous local authorities in England, serving a population of almost 520,000 people. Structurally, the Council is made up of five different areas – Transformation and Partnerships, Children and Young People Services, Adult and Health Services, Regeneration and Local Services, as well as Resources. 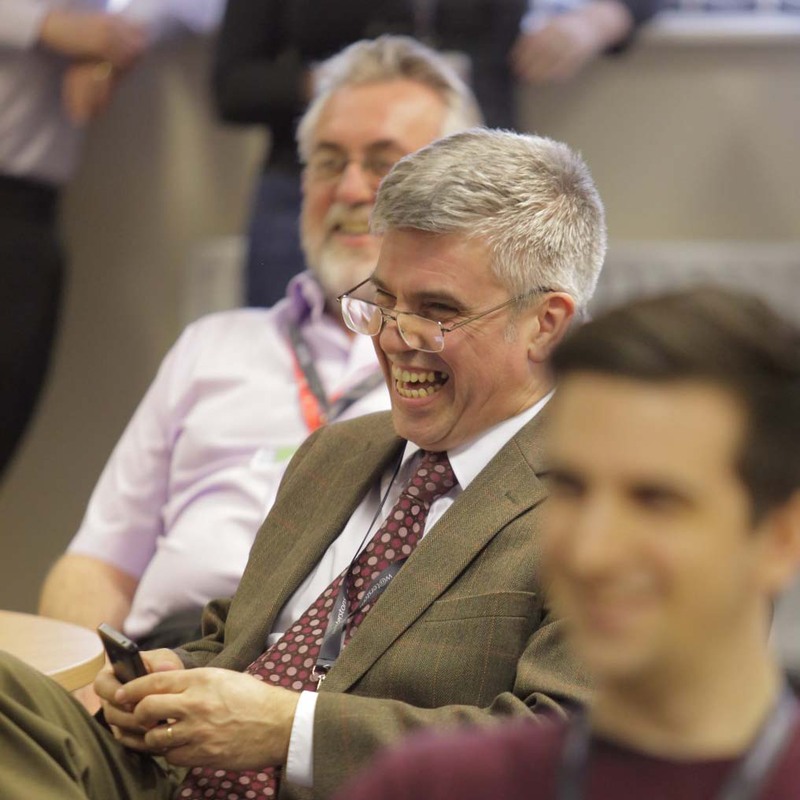 These service groupings are responsible for providing a wide range of services to the people of County Durham and it takes hundreds of members of staff to make it all happen, a user base of approximately 19,000 in fact, and all with their own unique IT challenges. In a typical month, the Service Desk at DCC receives between 5,000 to 6,000 calls from Council employees reporting IT incidents or making some kind of support request. While the team at DCC has done a great job of bringing this figure down from approximately 9,000 to 10,000 calls per month only a matter of years ago, the high level of call volume still means that the team are pre-occupied working reactively to incoming problems, rather than having the time and resource available to work proactively. Team DCC wanted to create time efficiencies to be able to look at the data gleaned from the incident and request tickets, to then be able to identify recurring problems and go on to fix them. So, DCC’s challenge to us at our client Hack Day was to find a solution that would facilitate Council employee ‘self-support’; essentially empowering members of staff to find the answers to their own queries, while affording the ICT team the time to become a business enabler. It’s about creating the time to be able to look at the real ICT issues behind the scenes, and finding ways to fix them, so that recurring problems stop cropping up time and again. Headed up by Paul Burgess, DCC’s Hack Day team consisted of Rebecca Wilson, Chris Redman and Imran Haq. Having met off-site with DCC for a full brief ahead of the Hack Day and taking the opportunity to see the service desk in action, to understand the common issues first-hand, our web wizards decided the best solution to meet DCC’s needs would be a bot. DCC has a wealth of manuals online, so the idea was to create a self-help system where Council employees could type in their question and be directed to the correct information, so they could quite literally fix the problem themselves. If for any reason the information wasn’t readily available the user could then be directed through to a member of the Service Desk team for further support with all the data regarding the nature of the query automatically attached. In theory, it would mean that only the really necessary calls would be handled by humans, therefore freeing-up some time for the team to work on identifying and fixing on-going issues for its users. Of course, the challenge here is how do you ask for something if you don’t know what you’re looking for? If, as a user of the Service Desk, you don’t actually know what the problem is, how do you find the right words to be able to search the system to then be directed to the correct piece of self-help information you need? Well, Team DCC was very aware that they wanted the bot to feel natural – almost like the user was talking to a human rather than a computer, and so it was decided that the bot would need to understand natural language and take into account that users would ask for the same information in many different ways. To help facilitate this, Team DCC used a piece of machine learning software from Microsoft called Luis. This piece of kit allows the bot to understand the language being used to ask for a piece of information, distil it down to an intent for future reference, which in turn allows the system to recognise several different ways of understanding the same type of requests. Then, it’s a simple case of directing the user to the relevant piece of self-help information. Clever stuff! Of course, never ones to shy away from a challenge, Team DCC had never actually used Luis before. But that’s totally okay. 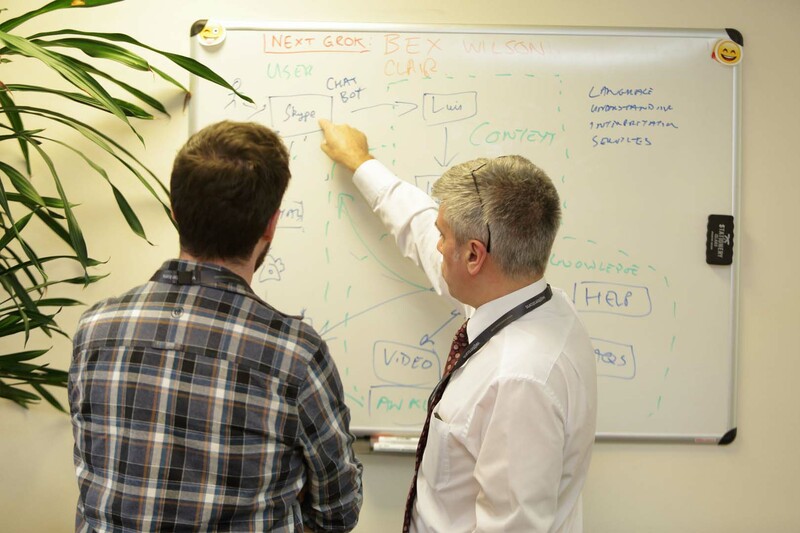 The purpose of our Hack Day is to allow our people the freedom and flexibility to try out new technologies they might not ordinarily use during the normal working day, while giving them the chance to collaborate with other members of the team they don’t normally work with too. It’s about giving our people the opportunity to learn new things together and from each other while addressing a real client brief. So, did it work? Absolutely! In the short space of six hours, and not forgetting a brief pause for pizza, Team DCC came up with a workable proof of concept for the client. At the end of the customer Hack Day, the team was able to demonstrate a working text-type bot using machine learning to pull info from the DCC self-help guides, empowering the user to fix the issue from their end, rather than having to call through to the Service Desk. After the hack day, we have something that could really work. You have made me rethink our approach to the service desk. At the moment, the bot is text-type only, meaning you type in a question and get a written response. However, through discussions with the client, it was agreed that there’s scope to expand this further into ‘ICT TV’. The self-help guides could be turned into short video clips, physically showing the end user what it is they need to do to be able to fix an issue themselves. If for any reason the user can’t fix the issue from their end, the service could be widened to include a face-to-face Skype call with one of the guys from the Service Desk. The working proof of concept has the power to provide huge efficiencies for the Service Desk team at DCC, reducing the number of calls and freeing up time to be able to identify recurring problems in order to address them, which then goes on to reduce call volumes even further. Team DCC’s solution also ties in with the Council’s ever-changing business model and the move to agility. A growing number of people at DCC work off-site or from home outside of the normal 9am – 5pm when the Service Desk is typically open. It means if disaster strikes even in the small hours of the morning when a Council employee is burning the midnight oil, there’s the potential to find the information they need autonomously to fix the issue. It means DCC employees will be able to carry on working, rather than having to wait for the Service Desk to re-open in the morning creating even more efficiencies and business benefits. ...and there was even some time left to play around with the Hololens.